Size of Baby: A watermelon! Ha. She's anywhere from 5.5-9 lbs (although we're pretty sure she falls on the lower end of that range). Cravings: Clementines & fruit loops. Weight Gain: 17 lbs. Exactly what my mom gained carrying me, which is interesting. 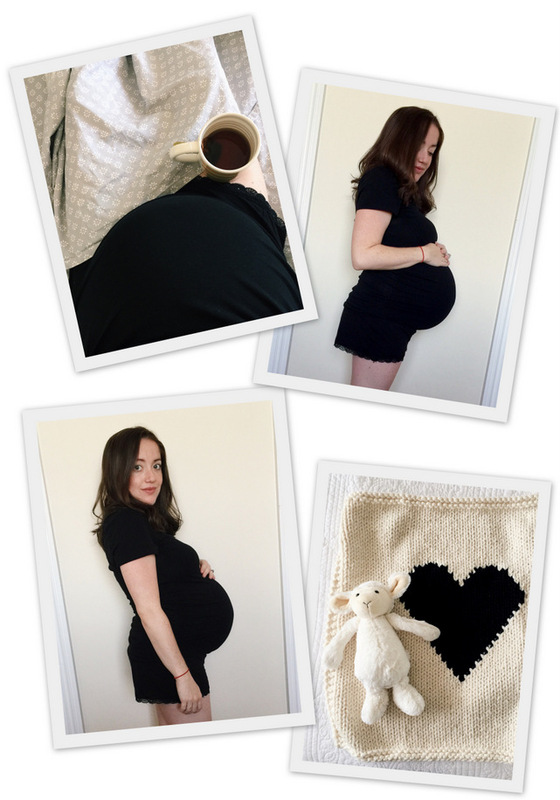 Maternity Clothes: Yes, especially anything soft, cozy & stretchy. The Gap Body collection has been my favorite maternity brand for everyday basics. Physical Symptoms: Not that many, oddly. She dropped, which took a lot of pressure off my lungs, so breathing is easier. My bladder feels like the size of a raspberry because of her low head position: I'm basically peeing on demand every 30 minutes. Under the recommendation of our midwives, I had a "physical therapy for labor" session earlier this week, which felt incredible. It loosened all those muscles and released tension in my lower back and hips. Fingers crossed it pays off during her delivery. Sleep: I sleep so much. It's fan-freaking-tastic. I know this will end VERY soon, so I'm really indulging my blissful 9-10 hours every night. Fears: I'm feeling especially calm and at peace. I don't know if that's because we're almost at the end, but I don't have any real fears (at least for today). I view birth as a natural process that will unfold as it is meant to. Moreover, both Tiho and I have the utmost faith in my care providers to guide the birth and any necessary decision-making. General Mood & Emotions: Giddy with excitement. I mean, hello: we're about to meet our daughter, a tiny human being who's been growing inside of me for the past nine months. Will she have a head full of hair? A tiny button nose? Scrunchy eyebrows? What will her temperament be? Will she be a November baby (oh gosh, please) or take her own sweet time and arrive in December? So much anticipation. I'd be remiss if I failed to mention how bittersweet all of this feels, though. I truly love being pregnant and know that I'm going to miss this season of life. Things I'm Looking Forward To: Looking into her eyes for the first time. Holding in her my arms. Seeing Tiho hold her in his arms. Snuggling up together under a cozy sherpa blanket as a family of three. Coolest Thing So Far: She instantly calms and relaxes when I put my hands on my belly during her movement routine. Also, hiccups! Too cute. "A baby is like the beginning of all things--wonder, hope, a dream of possibilities."